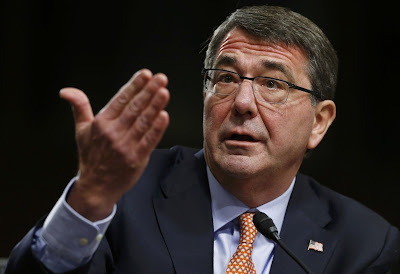 ABOARD A U.S. MILITARY AIRCRAFT -- The United States needs to take new steps to respond to the Ukraine conflict because economic sanctions and other Western actions have failed to get Russian President Vladimir Putin to reverse course, Defense Secretary Ash Carter said on Friday. Carter, speaking after conferring with U.S. officials in Europe, said the Pentagon was watching the Ukraine situation very closely and was concerned about "further things happening" after the worst upsurge in fighting in months. On Thursday, NATO Secretary-General Jens Stoltenberg accused Moscow of sending sophisticated new weapons to Russian-backed rebels in eastern Ukraine, including artillery and anti-aircraft systems. Carter called three dozen top U.S. officials to a session in Stuttgart, Germany, to discuss the effectiveness of Western sanctions against Russia and evaluate whether U.S. and NATO military exercises had reassured NATO allies and partners. The officials included U.S. ambassadors in Europe and most of the generals who lead U.S. military combat commands around the world. Carter held a similar session in Kuwait shortly after taking office earlier this year to look at Middle East strategy. "What’s clear is that sanctions are working on the Russian economy," Carter told reporters on his plane back to Washington. "What is not apparent is that effect on his economy is deterring Putin from following the course that was evidenced in Crimea last year," when Moscow annexed the Ukrainian territory. "There are other things we need to be doing in recognition of the fact that ... Vladimir Putin does not seem to be reversing course," Carter said, noting the response needed to be both political and military. Carter arranged the session ahead of a series of meetings addressing the issue this month - a G-7 summit in Germany, a NATO defense ministerial meeting and a European Union gathering that will consider renewing sanctions against Russia. He said the strategy session did not make decisions but did discuss a number of actions the U.S. military could take to strengthen implementing current policies. Carter said one action discussed was boosting the number of U.S. and NATO military training exercises. Another was to invest in military capabilities in Europe that could help NATO respond to the kind of asymmetric warfare used in Ukraine, when forces in unidentified uniforms, so-called little green men, joined the conflict. He called it a "mixture of subversion and sophisticated threat-making, manipulation of information, the big lie, all this cocktail that you saw in Ukraine."